How I won the lottery | What moves you? Employed by the bank of China she had fantastic benefits – shuttle service to work, shopping vouchers galore and a salary that allowed her to buy an apartment at age 26 – a mere dream for the majority of China’s workforce. And then she quit. SF and her husband are visibly agitated as they remember her regular 24 hour working days and tell of colleagues who sleep in the lobby at work. There is simply too little time to go home. As if emphasis is needed, they site this year’s ten stress related suicides at a Foxconn factory and assure me that this is not uncommon in China. Still, her decision to quit was very difficult and in my opinion incredibly brave. SF’s job at the bank of China was a once in a a life time opportunity, secured in no small part through her parent’s careful networking. The family’s decision to join the communist party of China, if only in name, was an unspoken prerequisite. In accordance was her parents’ shock as she decided to quit, in kind, her colleagues’ and boss’s reaction. Her reasons made little sense to anyone. Ethical dining. 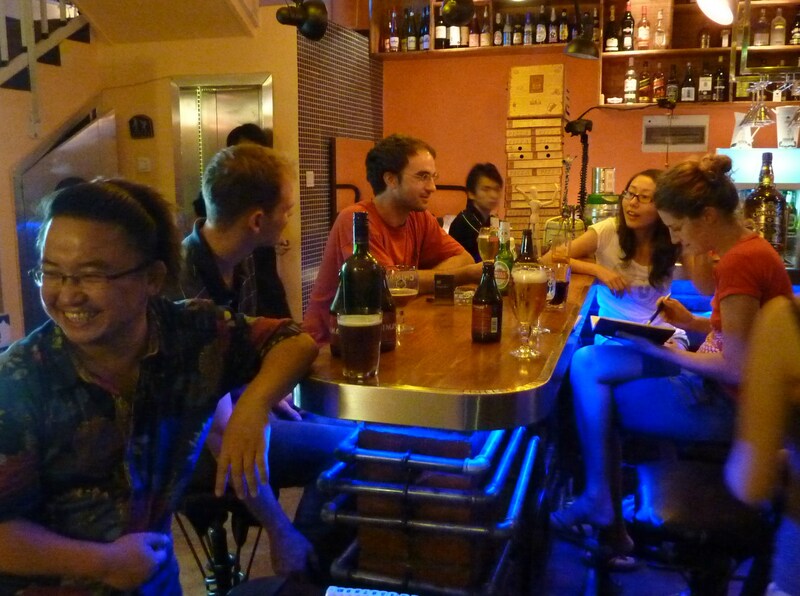 Picture of menu in an expat cafe in Kunming, China. As her story unfolds, so does my realization that simply being a middle-class member of the Western workforce, I belong to an exceedingly small and privileged global elite. The concept of regulated working hours and the understanding and respect for personal time away from work are in China not even granted in prestigious jobs. Listening to SF, my ability to choose a career seems fortuitous, almost a luxury. The opportunity to pause it is almost embarrassing. And what about the majority of workers in the world – those who earn barely enough to ensure survival? 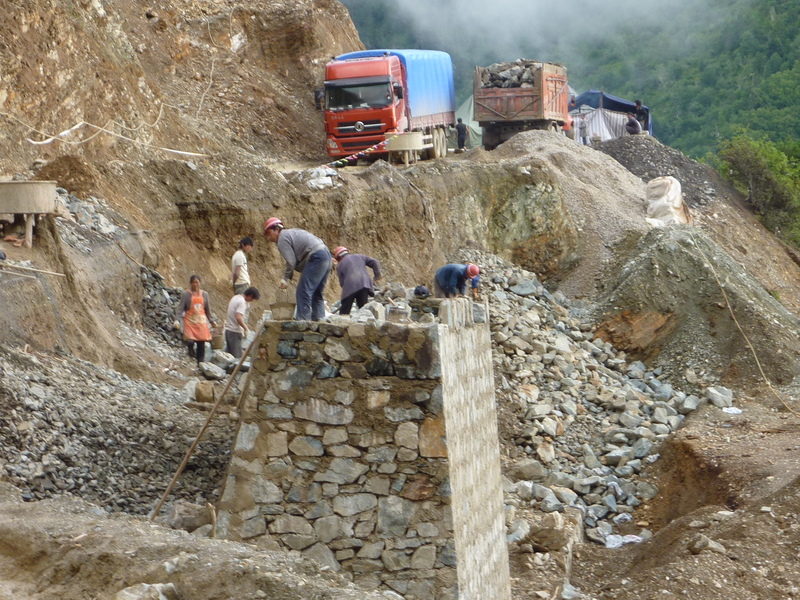 A few of China's 200 million migrant workers building a road in western China. At night they return to their temporary shelter alongside the road, where some of them live with their children - until the road is finished. I swallow hard as I hand over the money for an afternoon ice coffee, as I pay a Cambodian garment worker’s daily wage for a refreshing drink. I realize how insignificant $2 are to me and am aghast at how little $2 can actually buy: 1 ice coffee in an A/C cafe or 1 plate of fried rice or 1 thirty minute rickshaw ride. No matter how hard I try to adjust the worth of these $2 for local cost of living, it is not enough. Yet I meet someone to whom even this arrangement must seem fortunate. 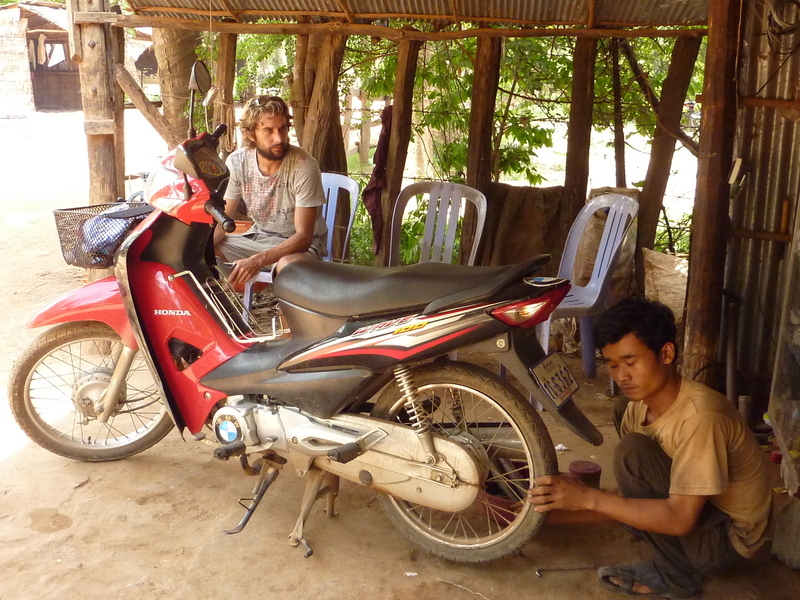 Stranded in rural Cambodia this mechanic fixes our flat tire for $0.45, labor and materials included. Ryan and I go for a cheap street side dinner one evening in Cambodia. As I push aside my nearly finished plate, a young boy comes out of nowhere, swiftly grabs my plate and hurriedly shovels down the four remaining spoonfuls of rice. This visual of poverty crudely breaks through the boundary of my comfort zone and leaves me feeling raw and powerless. In his life, there will be no career choice, no employment benefits and very likely not even an inadequate minimum wage. Wanting to fill the void in my heart as much as that in his stomach, I offer to buy him his own meal. The colors of poverty. Percentage of world population living on less than $2 per day. “We have no human rights in China”, concludes SF, exasperated and exhausted. Echoes of the multitudes resound in my head: China’s 200 million migrant workers, 10,000 garment workers in Cambodia, a boy searching for food in Phnom Penh. Faces flood my brain. Universal in theory, human rights, including workers rights, remain a prerogative of the few. Faced with my indescribable privilege, I have a thousand words to describe my feelings of moral obligation, struggles with the injustice and occasional embarrassment and yet it all boils down to this. I somehow got incredibly lucky and won the lottery of life. Unfairly, entirely undeserved, I was born at the better time in the better place. No more, no less. Full of awe I linger in the presence of this awful realization and then, I depart – with a new found gratefulness. (1) Phorn Bopha and Paul Vrieze “Thousands Strike for a Larger Wage Increase”, The Cambodia Daily, Vol. 46 Issue 5, July 14,2010. Keep exploring and thinking and writing. I love watching your progress. Thank you for following our blog Lisa! I agree with you whole heatedly about the moral framework inside us. It has been interesting to see how mine has changed and developed over the years and just when I think I have a few things figured our, many conclusions are thrown into question by a chance encounter or experience. Many thanks also for the book recommendations.